I recently discovered that Catriona McPherson, the author of the Dandy Gilver historical mysteries, also writes much darker contemporary thrillers. A while back I reviewed The Child Garden, which came out in September. The Day She Died was published last year. 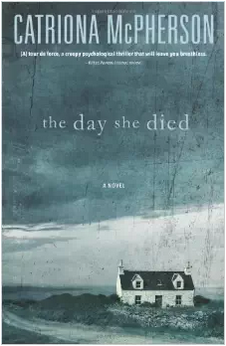 The reason I mention The Child Garden is that when I began reading The Day She Died, some of its elements seemed familiar—a lonely cottage in Scotland, a distraught man, a damaged heroine. But this novel is a different story altogether. Jessie Constable has spotted Gus King several times in town and even met him once, an encounter that thoroughly embarrassed her, but he doesn’t seem to recognize her when she finds him distraught in the grocery store with his young daughter. He has been talking loudly on the phone, and he explains to her that his wife Becky has just informed him she is leaving him and the children. Jessie decides he shouldn’t be driving, so she offers to drive him home, even though she will have to take a cab back. Once she arrives at his remote cottage on the seaside, though, she finds herself drawn further into his problems. Almost immediately after they get to the cottage, the police arrive to inform Gus that his wife has been found dead in a car accident, an apparent suicide. Gus begs her to stay, and soon she finds herself living with him and his two small children. Their relationship quickly turns physical. Still, Jessie keeps wondering about little things that don’t make sense. Where is Ros, Becky’s best friend, who looks so much like her? Who is the man who keeps trying to get her attention but can barely speak English? Chillingly, the book begins with a woman imprisoned in a small space. We don’t know who she is or what the time frame is, but we know that at some point Jessie’s romantic adventure will turn dark. I figured out some of the mysteries of this novel well in advance but not all of them. Jessie’s story is gripping and the situation much more complex than it seems. This book is a great psychological thriller. Ooh, this sounds good. And, the woman imprisoned in a small room makes me think of Captive. I’m sure it’s a very different story, though. I haven’t read that one, so I don’t know. It was tough, because I had that in the back of my mind the whole time I was reading but had no idea who it was or the time frame (before or after or during the bulk of the story). Also, I just noticed this is your 800th review! Woohoo!